ATLANTA - 14 yr. old college student, Stephen Stafford and Stanford University Graduate and Chris Draft Family Foundation Founder Chris Draft co-hosted a "Teen Mixer" during the FREE Parents-as-Partners Workshop Saturday, February 19, 2011 at the state of the art Villages at Carver Family YMCA in Atlanta. Stephen spoke to his peers about the importance of education and his "Journey to Morehouse" while Draft discussed the importance of literacy and character education, followed by a Playstation 2 tournament, teen networking and games! Parents are encouraged to bring their youth! Check out Photos from the Event!! Stephenʼs educational journey began in Detroit, Michigan at age 2 when instead of watching TV, he and his six year-old sister Martinique often played “school," where she began teaching him basic mathematics. Stephenʼs mother Michelle exposed him to an early education and marveled at what she thought was his advanced ability to learn. Through Stanford Universityʼs Education Program for Gifted Youth, Stephen excelled in advanced mathematics and mastered Algebra at age 6, Geometry at age 7 and Algebra II at age 9. Stephen became the youngest in Morehouse Collegeʼs 149 year history to attend as a full-time student at the age of 13. 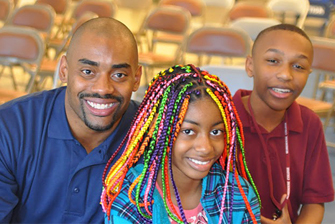 In 2006, Chris Draft established the Chris Draft Family Foundation. The Foundation focuses on seven primary initiatives with overarching themes that stress the importance of education, healthy lifestyles, character development, personal responsibility, self-discipline and physical fitness. The Foundation seeks partnerships with local and national community health organizations, school districts and non-profits across the country, striving to empower and uplift communities by educating and equipping families to make healthier choices. While the Foundation’s home office is located in Atlanta, GA, the Foundation is active all across the United States, working in communities across the country from Washington D.C. to Los Angeles, CA, and from Minnesota to Texas. The Foundation maintains a strong community presence in Chris Draft’s former NFL homes: Chicago, San Francisco, Atlanta, Charlotte, St. Louis and Buffalo, his birthplace of Kansas as well as his hometown of Anaheim, in Southern California. be Media Group is a full-service public relations firm that provides professional, results-based marketing, management and image consulting to youth and adults who have an extraordinary talent or craft that deserves a national platform. The Prodigy Project is a division of be Media Group, LLC, dedicated to promoting extraordinary young men and women from ages 2 to 21. It is the goal of The Prodigy Project to reflect a more balanced reality of American Youth.